The great thing about Opera Mini is that it works with a ridiculous number of handsets -- that's probably Opera proudly proclaims it's "the world's most popular Web browser for mobile phones" -- and a major new release has just hit the streets in beta form. Version 5 adds a few key features, including "speed dial" for calling up your favorite bookmarks quickly, improved touchscreen support, an integrated password manager, and most importantly, tabbed browsing. You've gotta be careful with this sort of stuff while it's in beta, of course, but hey -- it's a browser -- what can go wrong? 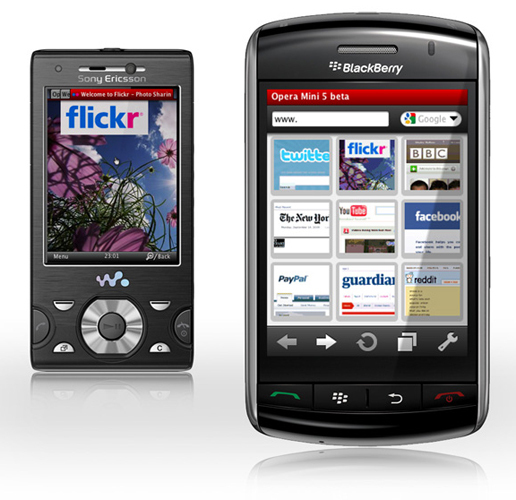 Grab it now (including a customized BlackBerry build) from Opera's site. Opera Mini hits version 5 in beta form originally appeared on Engadget Mobile on Wed, 16 Sep 2009 11:32:00 EST. Please see our terms for use of feeds.